A small press specializing in poetry, literary books, broadsides, and recordings. Read a review of the poems. 5″ x 7″, chapbook with two-color letterpress-printed cover and hand-stitched spine. for the Earth and its finite resources. filled with originality, intelligence and integrity. Crowe’s first major collection of poetry published here in the U.S. in 15 years. His seminal work that “engages life in all its political, economic, and spiritual diversity,” writes poet Jim Wayne Miller. 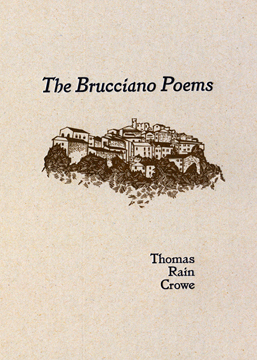 With an introduction by Poet Laureate of San Francisco Jack Hirschman who compares this collection favorably with the work of Dylan Thomas and Arthur Rimbaud.